Jerry has been an active member of the club since 1968. His club car is a 1934 Ford Roadster. He has been Club Treasurer, Vice President and People’s Voice. In 2009, Jerry became a Lifetime Member of the Club. He has been an Active Member for 44 years. Jerry also owns a 1950 Oldsmobile Club Coupe and a 1966 Ford Mustang GT Coupe. Figures Jerry Olds would own an Olds. Their daughter Melanie has a MS degree in Wildlife Biology and is working as a wildlife biologist in Kansas. Jerry is a retired Lab Technician from Alcoa. Janie is a retired educator. They are now both Antique Dealers. They have one cat named Lafayette. 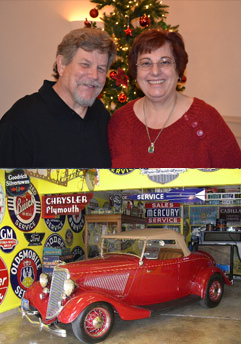 Jerry’s hobbies include collecting early automobilia, signs and displays. What it means to be a member of the L. A. Roadsters: Enjoys attending meetings with friends and organizing the Swap Meet for the Father’s Day Show.